Shanghai : August 5th 2010 – 5:30am: Low on the horizon the sun was a perfect pale red disc in a milk white sky as my taxi took me along the flyovers from my hotel to the airport. This was finally the day - at last I was on my way. This was a trip I had long waited to make. I’d often sat in airport terminals looking at departure boards listing flights to Chengdu, wishing that one of those flights had been mine; but now I had a ticket to Chengdu in my hand and it looked like I was the only Westerner waiting to board. The flight from Shanghai to Chengdu took only a couple of hours. In Louis Magrath King’s day the journey took much longer. I had looked into the possibility of retracing his route by boat along the Yangtze to Chongqing and then overland to Chengdu – but even if time and money had permitted the riverboat schedules weren’t right for the period when I was travelling. It’s still a journey I’d like to make one day. 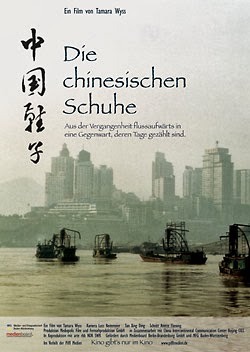 However, I have managed to travel it vicariously through an excellent documentary called Die Chinesischen Schuhe (2002-2004) by the filmmaker, Tamara Wyss. In this film Wyss retraces her grandparents’ journey from Shanghai to Sichuan, matching their old photos to present day views of the river as she travels. It’s an interesting film which also documents the physical and sociological changes to this dynamic river which have been brought about by the construction of the Three Gorges Dam. Wyss’s grandparents, Hedwig and Fritz Weiss, were contemporaries and indeed friends of Louis King. Fritz was a member of the German Consular Service, and he and Louis were both stationed in Chongqing at the same time. Louis mentions Fritz in his unfinished memoir and they both appear together in some of Louis’s photographs. Just as Tamara Wyss had done I was hoping to match some of Louis’s old photos of Tachienlu (Kangding 康定) to present day views. In Chengdu I checked into the marvellously dishevelled Jiatong or “Traffic” Hotel, as it’s known to foreign backpackers, which is perfectly located next to a bus station beside the Jin River. I’d already travelled to some quite remote parts of China before, but the journey ahead was set to be quite a step into the unknown for me, as I’d noted in my journal whilst waiting to board the plane at Shanghai: “I feel somewhat apprehensive but far more excited by the prospect of this present trip. This will be my first time venturing solo deep into China. It’s hard to know how I will fare with next to no Chinese language ability and no guides or [Chinese] friends for assistance. But I’m eager to take the plunge and see what I can find of old Tachienlu with its Tibetan Gombas, its raging rivers meeting between the high mountains that I only know from Louis’s old photos.” At that time there wasn’t much information on the web or even in the guidebooks. I’d spent ages trying to get a mental picture of the town from Louis’s old photos and the relatively few present day views I’d come across on-line, but this proved time-and-again to be a frustratingly difficult task; it was hard to get one’s bearings at such a distant remove, there was only one way to get a genuine sense of the place – which, of course, was to actually go there! The next morning I was up early. I checked out of the hotel and made my way to the bus station. I’d just missed the first bus to Kangding, but I managed to get myself a ticket for the next bus out an hour later. The bus was full and, once again, even though I’d not been the only foreigner at the bus station I was the only one on board this particular bus. With the luggage all loaded up below and a lot more crammed inside, and with everybody squeezed on board we roared out of the bus station five minutes early. I couldn’t help grinning, as this was it – only now I let myself believe it – now I was really on my way to Kangding – just 8 more hours on the road and I’d finally be there! The prospect of an 8 hour bus ride, bumping along precipitous roads in sweltering heat, might seem daunting today, but in Louis King’s time the distance from Yachow (present day Ya’an) to Tachienlu (Kangding) was 8 days – and Ya’an is roughly the halfway point from Chengdu to Kangding. 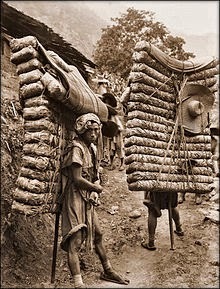 In those days the journey was made on foot with porters, horses, and “a chair” (litter) for carrying the wealthy Westerner or Chinese official, the whole entourage staying at roadside inns at the various stages along the way. This was the start of the famous Sichuan ‘Tea Road’, along which porters would walk carrying back-breaking stacks of brick tea to trade at the border town of Tachienlu. Not long after the bus had set out there was a bit of a reshuffle of passengers beside me as I was befriended by a young lad who wanted to practise his English. Lu Bin was travelling with his cousin, his Uncle, and his Uncle’s friend. The two boys had just completed their exams and were now on a three month trip overland to Lhasa before starting at University later in the year. When the bus stopped for lunch Lu Bin and his companions invited me to join them. As you’d expect in Sichuan the food was super spicy – I like spicy food, but this stuff really blew my head off! When it came to the end of the meal I was rather embarrassed as they wouldn’t let me contribute to the bill, insisting on treating me, they said, as their way of saying: “Welcome to China.” It turned out that this was just the first of many kindnesses shown to me by people I met along the way. Throughout my trip I was constantly amazed at the smiling friendliness and welcoming generosity of the people I met. As we roared up and down the hairpin bends, threading our way alongside the constantly tumultuous waters of the Dadu River, a noisy Jackie Chan movie played on a TV at the front of the bus, but I was completely oblivious, simply mesmerised by the view from the window. Like many places in such regions of Asia the river courses are dotted with dams and hydro-electric plants, both big and small. At one section there was what looked like an immense hydro-electric scheme under way which will eventually necessitate transferring the road from one side of the valley to the other where it will thread its way through a number of new road tunnels cut through the steep sided hills. The valley floor itself was then a huge construction site forming a vast dusty plain where large trucks were beetling around, loading up with broken rocks, or moving earth and rubble from one place to another. The bus lurched and bounced its way across the unmade surface with everyone groaning involuntarily with each sharp sudden bump until we got back onto the proper roadway. Looking at my watch I reckoned we still had a couple of hours to go when to my great surprise the bus slowed and then started to turn off the road. At first I thought it was another rest break in the journey but Lu Bin looked at me and happily announced: “Kangding!” We’d arrived in record time (6 hours), aside from the road accident we’d passed and a couple of minor landslides along the road we’d encountered no long hold-ups or delays. The bus driver had certainly gunned the bus along, and at each rest stop there had been thick hose pipes gushing water which had been shoved under the engine, presumably to cool it down and/or refill the rattly air-con. I was amazed at how quickly everyone got off the bus and found their baggage and then disappeared out of the bus station. I retrieved my rucksack and said farewell to Lu Bin and his companions, wishing them well for their onward journey to Lhasa, and then set off into town. Kangding is set at a fork in the hills where three valleys meet, here two rivers from almost opposite directions – the Zheduo and the Yala – merge and then flow together as one along the route I’d just come. As I walked along the river, looking up at the steep sided mountains which dominate the town a very strange feeling came over me. The sound of the river roaring alongside mixed with the noise and bustle of the traffic and the town seemed so bright and vividly alive. I was walking into a place which I’d never visited before, yet it all seemed oddly familiar. Slowly, as I walked, half-remembered grainy views and sites began to fall into place. Hitherto disconnected black and white photos were already starting to fall into place in my mind – linking up in ways which I’d been fruitlessly trying to fathom by staring at them for countless hours, trying to guess if the corner of a building in one photo matched that of a building in another photo looking in a different direction. This seemed to bode well for my researches during my coming stay. I had a week ahead of me in which to explore – but my first task was to find the hostel where I would be staying. I only had a very vague idea of its whereabouts from an internet map which seemed to think Kangding consisted of just two main roads. Kangding isn’t a large town by any means, but my first discovery was that the blank spaces on my internet map were in fact honeycombed with a labyrinth of winding little alleys and backstreets. Forget unfathoming old photos, clearly my first challenge would be finding my hostel!